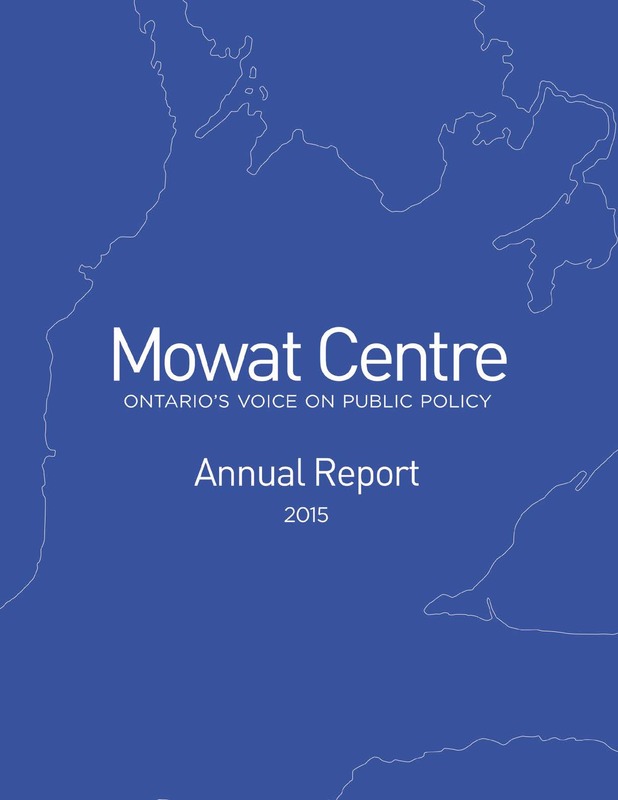 Mowat Centre’s annual report provides an overview of our publications, activities and public policy impact for the 2014-15 year. In the following pages we present our 2014-15 annual report. We marked our sixth year with several accomplishments including some important policy wins, successful new initiatives, and impressive growth in our reach and recognition among stakeholders and the public. Mowat continued to solidify its reputation as Ontario’s leading evidence-based voice on intergovernmental social and economic policy. That role was underscored when the federal government amended its proposed income splitting plan following a Mowat analysis that revealed it would have a significant adverse impact on provincial government budgets. A wide national chorus of voices echoed our concerns and the problematic features we flagged were eliminated from the federal government’s final Family Tax Cut proposal. The quality and relevance of our work was recognized by media, the public, and our peers in the research community. Nearly all of our publications this year received media coverage, with one report receiving over 100 media mentions. We nearly doubled our research references compared with 2013-14, and were cited in the work of researchers from seven Canadian provinces and 15 countries on five continents. Both the C.D. Howe Institute and the Canadian Centre for Policy Alternatives cited our work in their alternative federal budgets for 2015. And we grew our social media following significantly. In 2014-15 we introduced two new knowledge transfer initiatives. Our accessible and shareable policy blog TLDR was launched last summer and has exceeded our expectations for success. As of April 2015, we have published 32 TLDR posts providing research-based policy insight in an easily accessible — and sometimes light-hearted — format. Our first two Policy in a Pub events have proved very popular within the policy community. The events provide policy professionals with panel discussions on policy topics of the day in an informal setting conducive to interaction and the exchange of ideas. This year showed once again that our research remains in the policy conversation, continuing to have relevance and value, long after the initial publication. Fourteen of our reports published before this year earned 116 media mentions. Eighteen were cited in policy research work from other think tanks and research organizations, and fourteen were cited in academic work. We want to express our continuing gratitude to the University of Toronto and to the School of Public Policy & Governance for their ongoing support and encouragement. The School and the administration have provided a nurturing intellectual environment that both enriches our work and enables us to have a meaningful impact on Canada’s public policy conversation. We are proud of our progress in 2014-15, and look forward to doing even better next year.